As it’s made from high-quality plastic, it is durable and built to last. And most importantly, this fountain looks great and functions very well. What more could you possibly want? For a complete review of the TekHome solar fountain, see below. Running a close second in our list of best solar powered water fountains is the Supmovo 1.4W Solar Water Fountain[Amazon link]. It’s a powerful, sturdy, and easily transportable fountain with lots of features. It does everything to a high standard and is of pretty good value too. It just doesn’t look quite as good as the TekHome model. 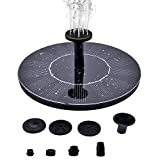 For a complete review of this solar fountain, check out our product reviews section below. 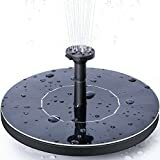 If you’re watching your pennies but still want a focus on quality and functionality, check out the OUSI solar powered water fountain [Amazon link]. It does exactly what you need it to and will cost you around half that of the TekHome model. While the OUSI fountain does not look quite as nice as the TekHome, it will still make a beautiful addition to anyone’s garden. In this section, we will look closely at several different solar water fountains, consider the positives and negatives, and explain why we have picked the favorites we have chosen. These units are great for aerating koi ponds, though you may want to pick up some additional aeration mechanisms as well. A pond pump, or a combined pond pump and filter system will be much more effective than a solar fountain at cleaning and maintaining water quality in ponds. But they’re much more expensive and more difficult to set up. The Tekhome 1.6W solar fountain works great in a variety of settings, from swimming pools to ponds to bird baths to fish tanks. It has a unique calendula shape that looks cool and is functional enough to start spraying water within 3 seconds of exposure to sunlight. There are no batteries on this unit, and all that is required it so choose one of the four spray pattern nozzles to place on the fountain, set it in the water in a sunny spot, and that’s it! This water fountain will look great in any garden or outdoor area. Its intriguing shape stands out and makes it a little more unique than the standard round models that are available on this list. As this fountain is solar powered, it needs only sunlight and water to operate. It has an auto-respraying feature that goes off every three seconds until the fountain becomes deprived of light. When spraying, this fountain is nice and quiet. In terms of build quality, there are no complaints. It’s made from high-quality ABS plastic and is both durable and easy to clean. Simply wipe clean with mild soap and warm water as you see fit. If you’re using the solar fountain in murky water, be sure to regularly clean the fountain to ensure it sprays. Assembly is fairly straightforward and can be done in a matter of minutes. It functions as it should (as long as the panel is in direct sunlight), and you get a nice range of sprays to choose from thanks to the 4 patterned sprays nozzles. Choose milder patterns for smaller pools like bird baths or pots, and wider sprays for larger pools. There is no battery used with this water fountain, which some may find annoying. The fountain will stop as soon as shade rolls in. But, it’s not massively expensive and adds a nice touch to the water feature. We should also note that if it is exposed to the sun without water, eventually the pump will burn itself out, so be especially careful in shallow birdbaths. Even though there’s no battery in which to store any energy, it’s still one the best looking and functioning water fountain there is available on the market today. It’s hard not to fall in love with the flowery calendula, shape as it makes the TekHome fountain so unique in comparison to most others you can buy. It is quite beautiful and calming, and would work wonderfully in conjunction with a wind chime! For the quality you get, this fountain is excellent value for money, and for that reason comes highly recommended. The Supmovo solar fountain is slightly weaker than the TekHome, clocking in at 1.4W of solar power. This unit works well, but as soon as any bit of shade hits the panel, it will shut off, so be sure to consider the sunlight environment in the location where you intend to put your fountain. This mid-priced solar fountain is not bad for the money. It has a simple circular look that works well in most garden settings, including ponds and bird baths. With 4 different heads that can easily be alternated for a change in the spray pattern, you won’t get bored looking at this fountain. The Supmovo solar birdbath fountain will keep going for as long as it’s kept in daylight. It’s quiet enough not to disturb any wildlife in the garden, yet effective enough to keep the water rippling to ward off any mosquitoes that may be lurking. Set up is simple and consists of solar panels and a brushless pump. There are no wires or batteries to fiddle with, and as long as the sun is shining directly upon the panel, it will work. The quality isn’t too bad either, but maybe not as good as some others available for the same price. Some buyers have had issues with their fountains not running properly, and Supmovo has been quite responsive in taking care of buyers’ issues. It does seem that Supmovo stands behind their products, and wants to make their customers happy, which is a big plus in our book. The Supmovo solar birdbath fountain is quiet, compact, and does work pretty well. However, for just a little bit more you could have the TekHome 1.6W solar fountain examined above, which is better value for money. It has a bigger motor for a start meaning it doesn’t have to work as hard to produce the same effect and will last longer. And, it just doesn’t have the same funky look either. The Ankway free-standing solar pond fountain has a very similar design to the Supmovo, and has the equivalent 1.4W power output. On the bottom of the fountain are suction cups that can be used to secure the fountain in place, or you can choose to let it float and move around a bit. Like the other solar fountains on our list, the Ankway needs to be in full direct sunlight to work. With a 1.4W solar panel to soak up the rays, this solar fountain will make a wonderful addition to any garden water feature. The Ankway solar fountain is moderately priced and works well with most bird baths, and ponds, but you may want to consider weighing it down somehow, as is a little flimsy and tends to float around too much otherwise. As it is made of plastic, the Ankway fountain is easy to clean. Simply wipe clean with a sponge and soapy water as necessary. Failure to clean the solar panel will diminish the power of the fountain, so give it a regular cleaning. Another good thing about this product is that it’s so simple to set up. Once it’s assembled, simply put it in the water and watch. As soon as direct sunlight charges the power, the pump automatically whirrs into life and water starts spraying. But be aware, when the sun goes down, this fountain will come to a halt. Like the other solar fountains on our list, there is no battery to keep it going. Also, be sure to peel off the plastic cover from the solar panel before installation, so that the solar panel will be exposed to as much sunlight as possible. Overall, the Ankway solar pond fountain looks pretty neat and is good fun having all the different attachments to play around with. The price of these units is not bad either! They are a good choice for many, and are covered under a 1-year warranty, which is a nice plus as well. 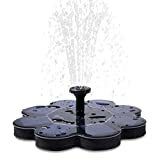 The Hiluckey 1.4W solar powered fountain is a very similar design to the other circular solar fountains on our list, and it does hit a nice price point. Like the other fountains covered here, this unit needs to be in direct sunlight to work, and has no battery. That means no fuss, but also a finicky fountain that will shut off in the presence of shadows. This solar fountain also has the most output of any sprayer on our list, so it may not be ideal for birdbaths — you may find that you need to refill the birdbath constantly. Made from a high quality, durable plastic this solar powered fountain pump works well in any pond, pool or fish tank. You don’t need much water for this pump to work, as long as no dirt gets sucked up into it. This may cause a blockage and prevent the pump from working. As long as there is sunlight and minimal water, it will work fine. On the underside of the unit are suction cups to keep the solar fountain in place, but they don’t work that well. It may be better to tie a heavy object to the bottom with fishing line to keep the unit in place. The Hiluckey solar fountain has followed the circular design similar to the other units on our list, but this model is slightly more funky, as has prominent stripes across the solar panels. The Hiluckey features several spray nozzle attachments, and has a powerful solar panel that will spray water higher than many of the other items on our list. To keep this solar birdbath looking its best, just give it a quick wipe with warm water and a sponge as you see fit. This solar powered fountain pump packs quite a punch compared to some of the others available on the market. And while that sounds good at first glance, it may not be suitable for small birdbaths as you could find it being emptied quite quickly. The Hiluckey is one of the better mid-priced models available, that provides you with everything you could possibly want in a reliable solar powered fountain pump. Although it’s followed the same circular design that the majority of fountain pumps have, its added solar stripes add a nice finishing touch. The OUSI Solar Water Pump Fountain is a nice solar fountain that hits a great price point, and is our budget choice. The OUSI has suction cups on the bottom to secure it, or it can be allowed to float freely (which works a little better). This solar fountain is powered by a 1.4W solar panel, and has a decent spray power. Like all the other units on our list, it is powered by its solar panel, and will only work in direct sun. This water fountain may be our budget buy, but don’t let that put you off. It looks the part, works well, and won’t you cost you many pennies either. One of the best features of the OUSI solar water pump is its simplicity. It’s so easy to assemble, and there’s no need for any maintenance other than cleaning. Simply place it in your birdbath, pond, swimming pool, or other water feature, and watch it set to work within about 3 seconds in direct sun. The fact that it functions so well may surprise some people considering it is the budget model, but for the money you’re spending it’s not bad. It doesn’t perform quite as well as the TekHome solar fountain, but as long as it’s kept in the sun, you get an even spray. And, because it comes with 4 different nozzle attachments, you can refine the spray pattern to get just the look you want. If you’re using this fountain in a birdbath, be sure to keep the water level reasonable, as you don’t want to run it without water in the birdbath, and the fountain can spray water out of the bath, especially if it is windy out. If you let the fountain run with no water in it, you will ruin the pump over time. The OUSI solar water fountain pump may not look quite as good as the TekHome 1.6W solar fountain, but it’s still a great bargain nonetheless. It functions quite well, and seems durable enough that it will last for a while. And, considering it costs almost half of what the TekHome model does, it’s a fantastic value for money and is definitely a model to consider if you’re on a budget. We hope you have gathered some understanding about the solar water fountain product line, and some insight as to the best option for your needs. All of the fountains on our list are pretty similar in design and functionality, so really any of them will serve your needs as long as you understand how these fountains work, and understand that they won’t be spraying if it’s shady or cloudy. If you’re looking for the best solar powered water fountain, then we highly recommend the TekHome 1.6W solar fountain pump [Amazon Link]. It’s functional, not too expensive, and its visually interesting design sets it apart from the rest. 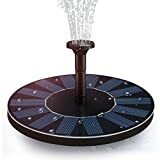 If you want to dip your toes into the solar fountain market, then the OUSI solar fountain [Amazon Link] is a good place to start, given its price point. You can try it out, see if you like how these solar fountains work, and then expand out to a higher end model from there.